Her cheeky smile lit up the room, warmed the hearts of listeners and revived the twinkle in the eyes of this aged woman and her life-time friends. They discovered that the simple pleasures in life were not lost forever; they discovered the marvelous blessings dental implants brought to their lives even then. What could dental implants mean for you? Do they hurt? Find out here. 15% out of the edentulous 35 million north Americans have dentures made every year. Dentures are a great quick fix to the problem, but have many annoyances that make you wonder if they are even worth it. 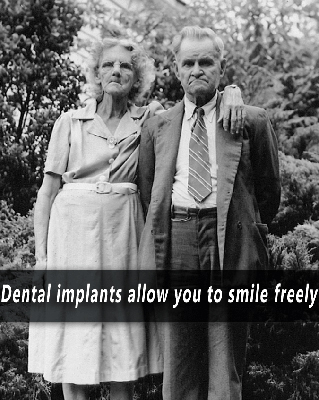 Dental Implants on the other hand, prove to be a blessing that many fear because they have a mistaken idea about them! At PV Smile, we use the best materials and Dr. Rivas’ blessed hands to create your perfect smile! Remember, the process is not painful at all! In the upcoming article we will explain that, for now, let’s take a look at some facts. Stimulate the bone cells of your jaw- preventing further decay and future tooth loss! Convenient for general oral health. Dentures are icky to maintain. Stabilize other, natural teeth- When your teeth are where they are supposed to be, everything else stays place. Look perfectly natural– Enough said! Support natural chewing function- No more clicking, sliding denture while you eat! Let you smile with pride on any occasion. At PV Smile, we use state-of-the-art dental implant technology and use the most advanced dental & surgical techniques and methods during your procedure. Contact us today to schedule an appointment and start talking about your perfectly natural, healthy, and functional smile!